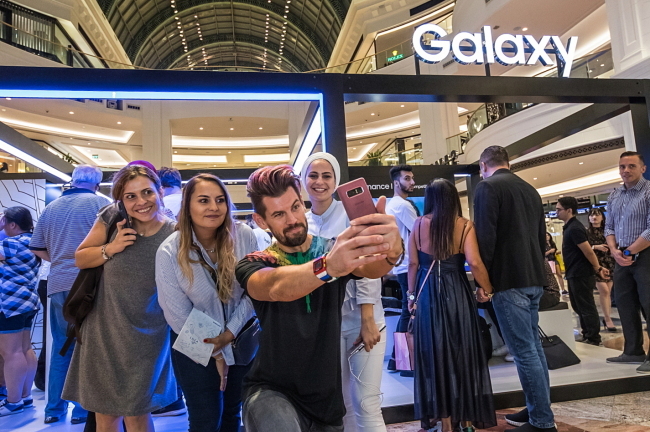 Samsung Electronics on Friday officially launched the Galaxy Note 9 smartphone in 56 markets around the world, including South Korea, the US, Canada, China and India, as well as all of Europe and Southeast Asia. Following this initial rollout, the South Korean tech giant plans to bring the Note 9 to 120 markets by early September, and embark on expanded marketing activities, the company said. The ninth edition of the Galaxy Note series sports a 6.4-inch AMOLED display and the largest-ever battery volume of 4,000 milliampere-hours for all-day performance. Its standout feature is the low-power Bluetooth-enabled S Pen that serves as a remote control for taking selfies and group pictures, presenting slides and more. It is also compatible with the Samsung Dex, which enables a desktop experience on the smartphone, and Bixby smart assistant. The device’s intelligent camera is powered by deep learning-based capabilities, including Flaw Detection and Scene Optimizer, to deliver high-quality pictures. The Note 9 is available in 128-gigabyte and 512GB models, with support for up to 1 terabyte of storage via expandable memory. It is available in three colors: midnight black, lavender purple and metallic copper. In Korea, the 128GB Note 9 is priced at 1.09 million won ($970), while the 512GB Note 9 costs 1.35 million won. It is available through the country’s three major telecom companies as well as online retailers.